The DEAR HEART brand celebrates the modern romantic. With flowing silhouettes and simplified details, the collection is tailor made for dreamers, lovers, and free spirits. Perfect for Old Souls who have found New Love. In a soft gold outlined brocade, GOLDIE has a vintage vibe in a modern, flattering silhouette. The v-shaped neckline is elongated by the princess lines, which continue down into the full A-line skirt. Built to shine like the stars above, Celestia is made of a soft gray organza with a glimmering silver lurex thread throughout. With a spaghetti strap bodice and a swagged skirt, Celestia has a romance that harkens days gone. The lightness of the AYR gown is juxtaposed with the volume that surrounds you. Made with a structure Faille bodice and layered silk organza, AYR is a prefect combination of contrasts. 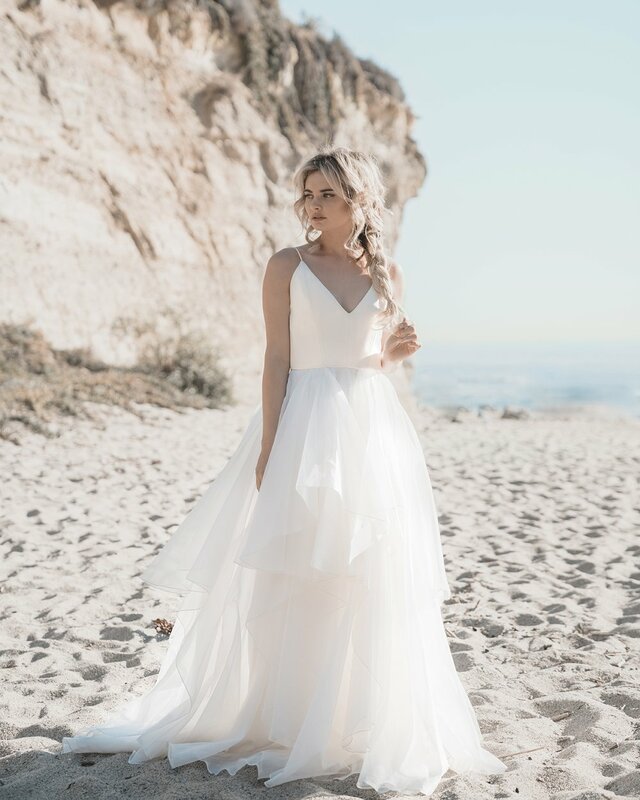 With the whimsy of a full overskirt, and the slim silhouette of a column gown, the EDEN is made for the original woman. With a V-neck faille bodice and petal appliquéd tulle skirt, EDEN is organic and elegant. A soft rose print organza draped on an aline skirt has the softness and subtlety of a secret love. FAWNIA can be worn strapless with a dramatic pointed bodice or with cross-back straps.